Floyd Collins, right, proposed the committee on police and fire buildings. 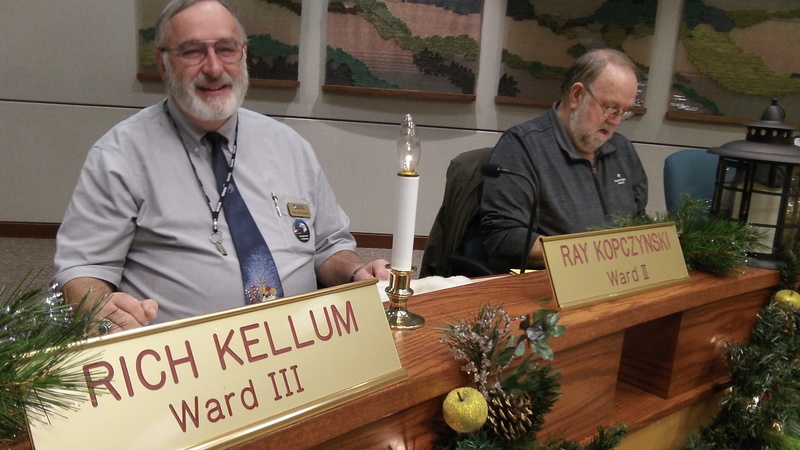 Ray Kopczynski sits next to him at the council table. Albany voters said no to a $20.3 million bond in November for building a new police headquarters and replacing the main fire station downtown, and now the city council has made a new start in trying to win their approval. It will seek the advice of respected and independent reviewers. The council has agreed to form an autonomous committee to review the building proposals and recommend ways to try to “secure voter approval.” Retired state Sen. Frank Morse, R-Albany, and retired Linn County Sheriff Dave Burright are to head the panel and select its members, including an architect, an engineer, a certified public accountant, a business owner, a building contractor and one “government” representative. The panel is meant to subject the city’s building proposals to an outside review. It is to make sure the plans respond to voters’ concerns and are not wasteful or extravagant and, once approved, are completed in an economical and sensible way. By approving Councilor Floyd Collins’ concept and outline of this committee, the council promised not to direct or try to run the panel. Having Morse and Burright in charge is a guarantee that the promise is kept. Since this committee will attempt to influence the city council and city voters on a property tax issue that will financially impact every city resident, shouldn’t a basic requirement be that each committee member (including the co-chairs) have their principal residence within the jurisdictional limits of the City of Albany? Frank Morse seems like a fine gentleman, but I don’t think he meets this basic requirement. As long as they combine both on one ballot, my answer is NO! I’d approve a fire station, but moving the police station away from the population center is simply stupid. Let’s face it. IF they accomplish that, they’ll want a sub station to serve more eastern parts of town in the interest of “Public Safety”. Don’t fall for their “plan”.